It's that time of the year again, time to look ahead. 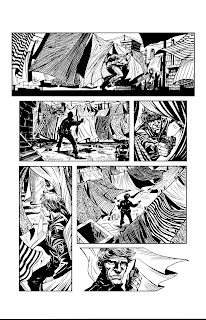 I had a pretty modest comic book output in 2010, but with any luck 2011 will be different in that regard. For one thing, DYNAMO 5: CERTAIN DEATH is already underway. 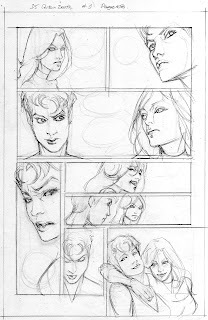 Julio Brilha is hard at work on the pencils. This will be another mini-series (five, perhaps six issues) and is going to shake things up for the Dynamo kids in a major way -- starting with the death of one of the characters. And this being Image, there's nothing that says I have to revive the character later this year. So this death could actually be, gulp, permanent. 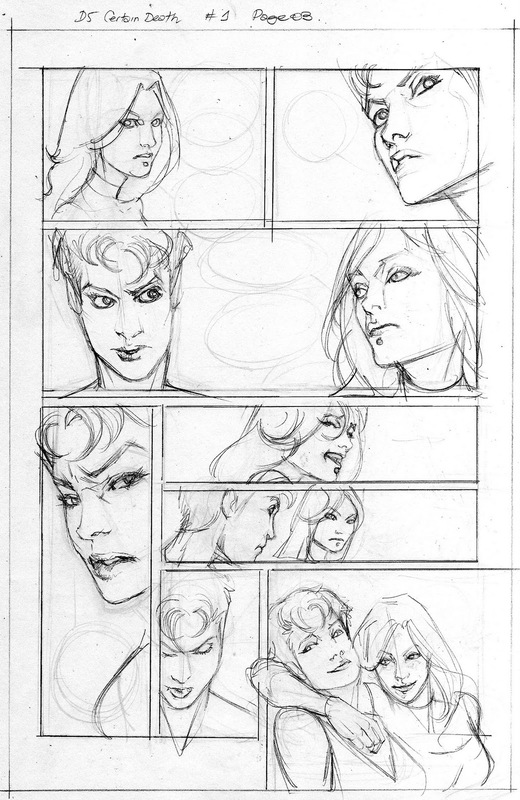 Just for grins, here's a look at a page of Julio's rough pencils for our first issue. If all goes according to plan, I'll also be launching a new ongoing series at Image, with artist Simone Guglielmini. It's a crime book called NEAR DEATH and because I'm feeling generous, here's a look at an interior page from our first issue. 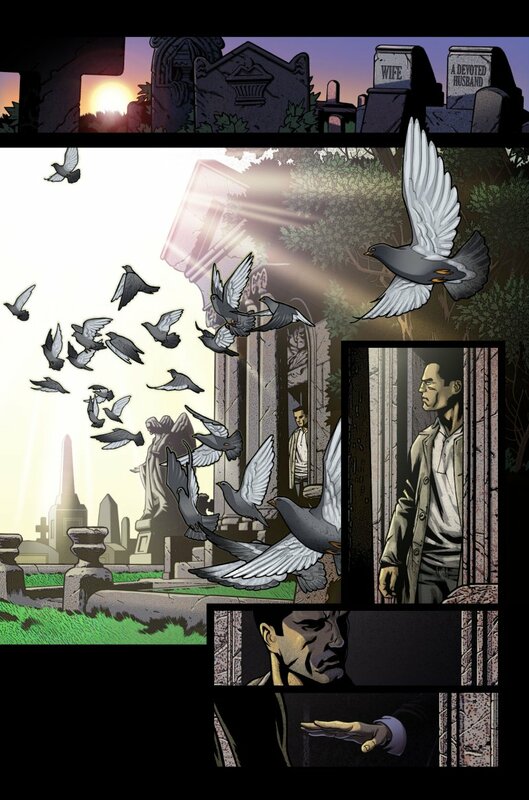 Art by Simone, colors by Ron Riley. This is the first time we've publicly posted any art, or mentioned our collaboration. Simone's hard at work on the second issue already, but we're not doing a formal announcement or solicitation until we have a nice, solid lead time. The plan is to be able to launch it sometime in 2011. Next up is POINT OF IMPACT, another Image crime book. This one's a B&W mini-series that's been in the works for awhile. Again, we're not soliciting it until we have a solid lead time. Art is by Koray Kuranel, an insanely talented artist I met through my old friend Yildiray Cinar. 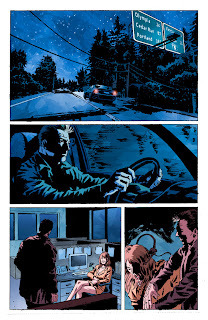 Here's a look at the art from issue #2. And the last project I hope to release in 2011 is GRAVEYARD SHIFT (formerly known as UNDYING LOVE -- we changed the title to accommodate Tomm Coker's new Image series by the same name), a horror/romance/crime mini-series drawn and colored by Fran Bueno, who had a fantastic run on NOBLE CAUSES years ago. Fran and I have been working on this book for literally years, and we think we'll be able to release it in 2011. He's really pouring his heart and soul into this book, and it shows on every page. 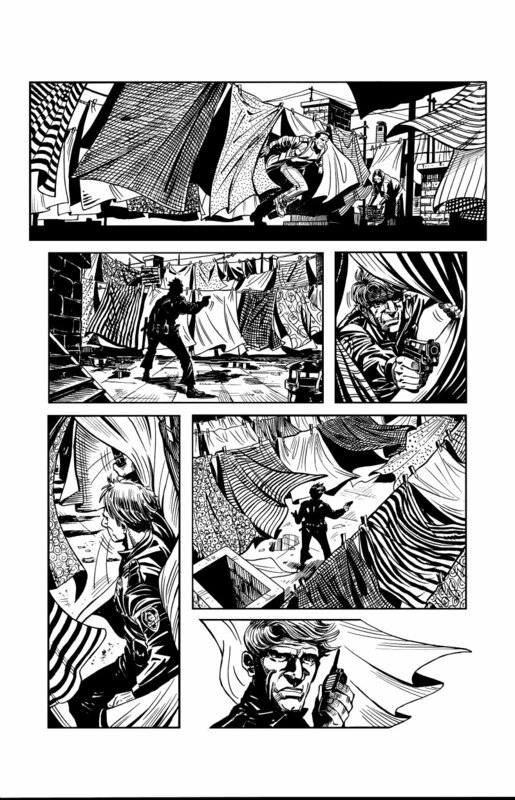 Here's a page from issue #2. So that's what my comic book slate looks like in 2011. It sounds like a pretty productive year, and that's not even considering the fact that I hope to join the writing staff of a TV series for the 2011 Fall season. As I mentioned in my previous post, I'm currently part of the Warner Bros TV Writers Workshop. The program concludes at the end of March, and assuming I don't screw up too badly, I'll be sent around for interviews for staff writing gigs on various Warner Bros TV shows. These are shows produced by Warner Bros and their cable arm, Warner Horizon. Shows like THE MENTALIST, FRINGE, V, SOUTHLAND, THE CLOSER, TWO & A HALF MEN. These are all Warner shows, regardless of the network (or cable channel) on which they air. Although chances are I and my fellow classmates will end up on new series, rather than existing shows. The workshop is great, although intense. I'm surrounded by really talented writers and really smart, experienced instructors. So I've really had to bring my A game. Which makes me glad I'm so far ahead on my comic book projects. I've got a lot of scripts in the can for these various books, which means I can give this TV-thing my full attention. 2011 is looking up to be a really great, productive, exciting year for me. I hope it is for all of you! Those sound cool, and I'm looking forward to all of them! okay, I think I'm going to go a little geek here and exclaim "OMG! You're a comic artist? That's so awesome!" I want to be a comic book artist too, along with writer of traditional books. It would be awesome to hear how to do all of that. Click on the link and Watch TV Shows Online. And share this link with your friends too. I hope you ill enjoy your favorite series online. I like your blogging. Its nice and amazing. Keep it up and post some new work. Thanks. Jay, just finished issues one and two of Near Death, and I needed to tell you how great they were. Great episodic approach, and a very simple, yet effective concept. Really well executed. Nice effort...Please visit and comment about my Blog and Website..These are about Music And Media..
Portefeuilles Louis Vuitton Soldes a good good friend, an The english language industrialist, virtually any broker prosperous. Relate with the actual dignitaries, hence the power to submit an application their own economical COCO save specially.